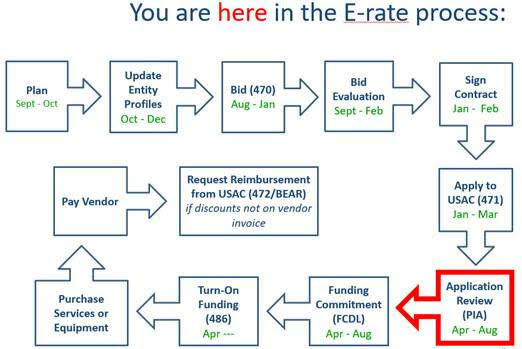 The Program Integrity Assurance (PIA) process is a detailed USAC review of each Form 471 to determine whether the products and services requested are eligible for E-rate funding, whether your requested discount rate is valid, whether you have stayed within your Category 2 budget, and whether you are an eligible entity. This year we also are seeing a major emphasis on substantiation of requested dollar amounts, including taxes. All PIA inquiries are done in EPC, and all applicant responses to these inquiries must be submitted via EPC. The PIA review process will be identical to last year, which is that the Form 471 contact will receive an e-mail indicating that a PIA reviewer has questions related to the application. The e-mail will contain a link to the actual PIA inquiry(s) in EPC (you must be logged-in to EPC to see it). To see the questions, click on “Respond to Inquiries” at the top right corner of the page, which will then turn the Inquiry Name into an active blue hyperlink. Click on the hyperlink and the list of questions will appear. You must respond to all of the questions in an inquiry at the same time. If a question is not applicable, but the text box will not allow you to proceed without an answer, simply list N/A. If you are unclear about the questions being asked, you may e-mail the PIA reviewer to request clarifications. Use the e-mail address that was listed on the original PIA reviewer’s message. * Already, 778 FRNs (out of 2469) are in ‘Wave Ready’ Status. If you haven’t yet been contacted by PIA, don’t worry, your time is coming! * Contact Julie if you are unsure how to respond to a PIA question, or need help validating an entity. * The first funding wave is expected to be released around the week of April 22, with funding waves coming each week thereafter. Deadline to Reply: These are serious inquires that must be addressed in a timely fashion. PIA inquiries typically provide 15-day deadlines for responses but I encourage you to respond as soon as you receive the e-mail. The sooner you respond, the sooner you’ll receive your E-rate FCDL. If you haven’t responded to the PIA inquiry within 7 days of the initial request, PIA will send you a reminder. If you haven’t responded after 15 days, USAC may act on the information they already have to make a funding decision (which typically means denial). Need an Extension? You can request a 7-day extension of the original deadline if you need more time. To do so, access your PIA Inquiry in EPC, choose Related Actions, then Request Extension. The first extension request will be automatically granted. If you still need more time, you may request an additional extension if absolutely needed. A guide to the EPC-based PIA review process, including screenshots of the EPC PIA inquiry pages, is attached. Slide 12 of the guide also shows where to find the current status of your Form 471 application. Many applications are already in “Wave Ready” status, despite not receiving any PIA inquiries. If you have any questions about your PIA inquiries, please don’t hesitate to contact me at jtschell@comcast.net.